The first Endicott Period mortar batteries were based on experiments by Colonel Henry L. Abbot (Cullum 1632) with muzzleloading 13" mortars. Abbot configured the mortars into "quads", four mortar pits with four mortars in each pit arranged in a rectangle. The objective was to salvo the mortars so that they provided a pattern of coverage that greatly increased the probability of hitting a moving target. As the first 12" breech loaded mortars (BLM) became available (M1886) the first batteries were constructed along the lines of Colonel Abbot's quad design. 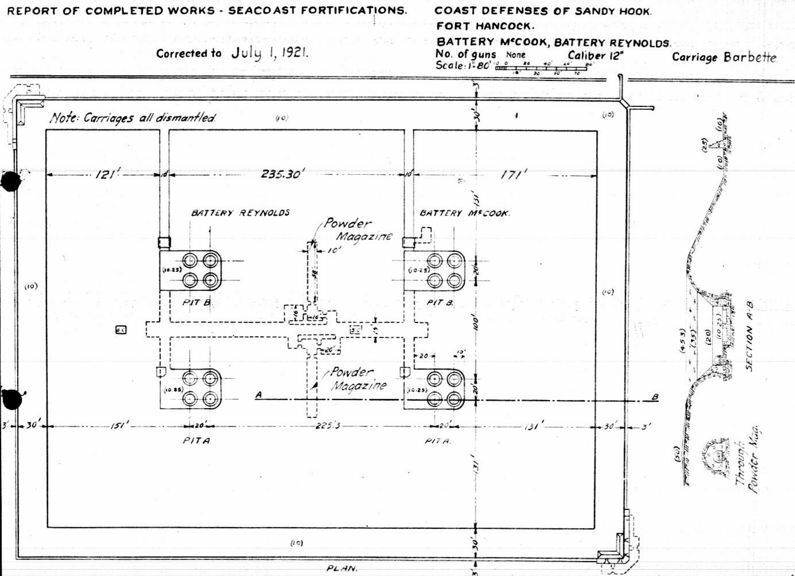 The service battery at Sandy Hook (later Fort Hancock) was one of the first built and because of the proximity to the proving ground at Sandy Hook the first set of set of proof firings yielded important test results. Volleys of all sixteen mortars at the same time took place on 11 Apr 1895 and yielded important results that seemed to validate his earlier experiments. Abbot Quad Battery, Fort Hancock, Battery Reynolds Mortar Pit B (2010). Imagine 100 troops and four large mortars in this pit. Colonel Abbot reflected in 1896 that some 40,000 rounds of mortar ammunition were expended in perfecting the quad concept and that group control was essential to achieving perfection. He also acknowledged that the enormous expenditure of munitions required to equip a battery "(1700 tons to equip a sixteen-mortar battery with 200 rounds)" presented "troublesome engineer conditions." Five mortar batteries were under construction at the time of the tests, all using the Abbot quad configuration and a total of six were built, Battery Lincoln-Kellogg, Battery Haskin-Overton, Battery Reynolds-McCook, Battery Rodney-Best, Battery Capron-Butler, and Battery Howe-Wagner. Two "Half Quad" were constructed, Battery King and Battery Whitman. After the salvo tests it became clear to some that the servicing of sixteen mortars simultaneously in confined spaces presented challenges in terms of the numbers of people required, the efficiency of the crews in the crowded mortar pits and safety. The first change came by arranging the four mortar pits in-line all with open backs. This change was followed in most batteries constructed after 1896. In 1906 the batteries with sixteen mortars were administratively divided into two batteries of eight mortars each (2 mortar pits). This was followed with a longer term program of physical removal of two mortars from many of the mortar pits. All of these changes combined with improved fire control improved the efficiency and accuracy of the mortar batteries. Naval armament improvements and aircraft soon rendered most coast mortar batteries obsolete because of their limited range and vulnerability to air attack. Most mortar batteries remained in service until 1942 when their value as scrap exceeded their military value. Fort Morgan Battery Dearborn Mobile Two Pits 8/4 M1890MI/M1896MI 1900-1901-1901 1931 ? Fort San Jacinto Battery Mercer Galveston Two Pits 8/4 M1890MI/M1896MI 1897-1899-1899 1943 ? Fort Crockett Battery Izard Galveston Two Pits 8/4 M1890MI/M1896MI 1899-1900-1911 1943 ? Fort Rosecrans Battery Whistler San Diego Two Pits 4 M1890MI/M1896MI 1916-1919-1919 1942 ? Fort Rosecrans Battery White San Diego Two Pits 4 M1890MI/M1896MI 1915-1919-1919 1942 ? Fort MacArthur Battery Barlow-Saxton San Diego Four In Line 8 M1912/M1896MIII 1915-1919-1919 1943 ? Fort Funston Battery Howe (2) San Francisco Four In Line ns 4 M1890MI/M1896MI 1917-1918-1919 1945 ? Fort Miley Battery Livington-Springer San Francisco Four In Line 16/8 M1890MI/M1896MI 1899-1902-1902 1943 ? Fort Winfield Scott (2) Battery Howe-Wagner San Francisco Abbot Quad 16/8 M1886M/M1891 1893-1895-1900 1920 ? Fort Winfield Scott (2) Battery Stotsenburg-McKinnon San Francisco Four In Line 16/8 M1890MI/M1896MI 1897-1898-1900 1942 ? Fort Barry Battery Alexander San Francisco Two Pits 8/4 M1890MI/M1896MI 1901-1903-1905 1943 ? Fort Stevens Battery Clark the Columbia Two Pits 8/4 M1890MI/M1896MI 1901-1903-1905 1943 ? Fort Canby Battery Guenther the Columbia Two Pits 4 M1890MI/M1896MI 1918-1922-1922 1942 ? 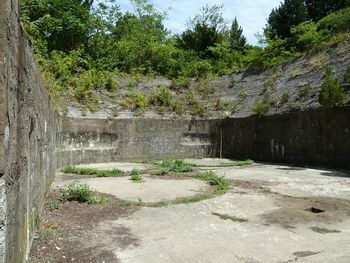 Fort Flagler Battery Bankhead (1) Puget Sound Two Pit 8/4 M1890MI/M1896MI 1900-1902-1902 1942 ? Fort Casey (1) Battery Schenck Puget Sound Two Pits 8 M1890MI/M1896MI 1898-1899-1902 1942 ? Fort Casey (1) Battery Seymour Puget Sound Two Pits 8/4 M1890MI/M1896MI 1898-1899-1902 1942 ? Fort Worden Battery Brannan Puget Sound Two Pits 8 M1890MI/M1896MI 1899-1901-1902 1943 ? Fort Worden Battery Powell Puget Sound Two Pits 8 M1890MI/M1896MI 1899-1901-1902 1943 ? This page has been accessed 2,505 times. This page was last modified 19:55, 27 April 2014 by John Stanton.